Chicago Harper 's Court brings back Chess! In August, while visiting my hometown of Chicago, I passed through Hyde Park's Harper Court. Apart from visiting the stores, my main purpose is usually for reliving the nostalgia of my early chess-playing days. 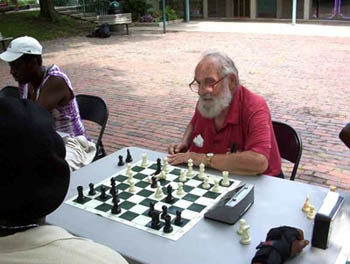 Chess had been banned in 2002 in an ongoing dispute, but to my delight, I found chess players there once again including my high school coach, Tom Fineberg. Fineberg, who should be called the "Dean of Chicago Chess," has worked tirelessly in the scholastic chess arena and has been an organizer of Chicago tournaments for decades. The story below was featured in the Hype Park Herald which brought light to the controversy which banned chess players from playing in the area. After intense lobbying in the City Council and contentious meetings, a compromise was made. Todd Spivak, Harper Court compromise limits chess to Weekends," Hyde Park Herald, 18 July 2003. Following two months of negotiations with a small committee of chess advocates, the Harper Court Foundation last weekend officially welcomed chess back to its red-brick retail square on Harper Avenue between 52nd and 53rd Streets. The two sides reached a compromise last Friday that places a series of new burdens and restrictions on the players. For instance, chess will be allowed only on the weekends during limited hours through the summer months. Also, players have to foot the bill to purchase their own tables and chairs. For their part, Harper Court agreed to store the furniture free of cost. Players once again congregate at Harper Square, a once-popular chess "watering hole" in Chicago. The agreement came more than a year after the Foundation rid the square of four concrete chess benches and hung "private property" signs as a warning to players to stay away. The move set off a storm of criticism, as Hyde Parkers protested the abrupt end of a 35-year-old neighborhood tradition beloved for uniting people of every age, class, race and ethnicity. Many Harper Court business employees expressed relief last Saturday afternoon as a crowd of people gathered under a hot sun to watch the matches. "The return of the chess players will increase business for all of us merchants," said a jubilant Virginia Guss of Akente Express II. Charly Gibbons, an employee of Toys et Cetera for more than 20 years, said that without the players Harper Court had begun to feel "like a ghost place." "I think it's somewhat restrictive that they can only play on weekends," said Gibbons. "They should be allowed out here all the time." Members of the Citizens Committee for Chess in Harper Court say they will lobby the Foundation again in the fall to bring back the original concrete benches and allow chess matches to be played during weekdays. "We're better off than we were months ago," said committee spokesman Alon Friedman. "But this is just a trial run; negotiations are not over yet." Committee member and chess instructor Tom Fineberg said, similarly, "If the Foundation mellows out, maybe we'll get more of what we want." 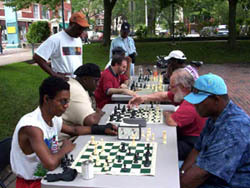 Leslie Morgan, executive director of the Harper Court Foundation, and Arnold Romeo of the city's Commission on Human Relations, which mediated the chess dispute, declined comment for this article. Chess matches will be played in Harper Court every Saturday, from 11 a.m. to 7:45 p.m., and Sunday, from 12 p.m. to 5:45 p.m., through September 28. Those interested in contributing to the cost of tables and chairs should contact Alon Friedman at (773) 324-4813.